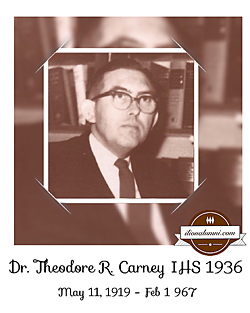 February 2, 1967 Ilion - Dr. Theodore R. Carney, 47, of 12 Crescent St., a prominent Ilion doctor, died yesterday in his home after a long illness. He was born in Ilion, son of James Edward and Helen Ducette Carney. He was graduated from Ilion High School in 1936 and was a clerk in Remington Arms until entering Syracuse University in 1940. He received his medical degree in 1946. At the same time, he was commissioned a first lieutenant in the Army Reserves. He had previously served 2 1/2 years with the Army Medical Corps, serving at Camp Pickett, Va..
Dr. Carney interned at St. Mary's Hospital, Rochester, returning to Ilion in 1949 to open an office for general practice. He married the former Margaret M. McArdell of Clay in 1946. He was a member of Nu Sigma Nu Medical Fraternity, the Church of the Annunciation, Tri-County Medical Society, Knights of Columbus, Holy Name Society, Ilion BPO Elks, and the Cedar Lake Club. Besides his wife, he leaves six daughters, Bridget, Kathleen, Mary, Roberta, Aileen and Erin, and three sons, Patrick, Shawn and Theodore Jr., all at home. The funeral will be at 9 Saturday from the Applegate Funeral Home and at 9:30 from the Church of the Annunciation with a solemn requiem Mass. Burial will be in Calvary Cemetery. Calling hours are from 7 to 9, tonight and 2 to 4 and 7 to 9 tomorrow. The Ilion K. of C. and Holy Name Society will recite the Rosary at 7:30 tomorrow night, Elks services will be at 8 tomorrow night.